On 28th September the world celebrated the 10th World Rabies Day and animal welfare organisation, World Animal Protection celebrated a major achievement giving over 1 million rabies vaccinations to dogs across the globe. 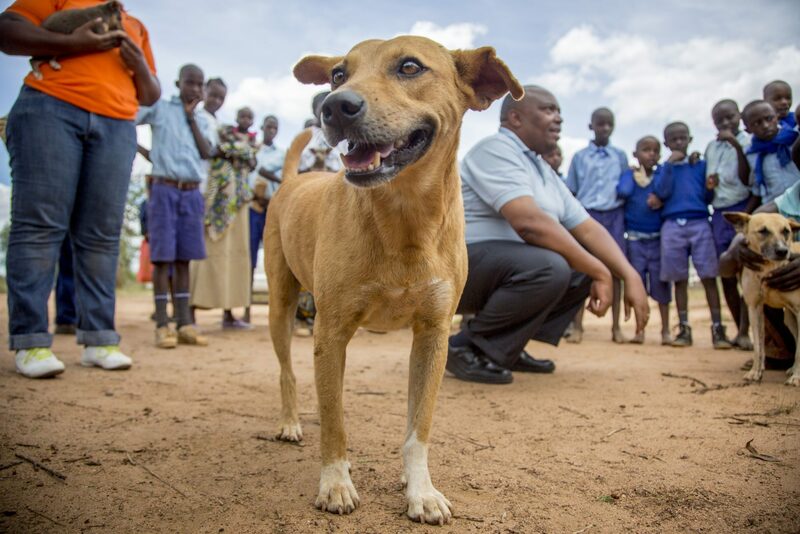 To mark the occasion, let’s take a look at Kenya’s huge leaps forward to eliminate this ancient disease since we last updated you in March, writes Ellie Parravani, a campaigner for 'Better Lives for Dogs'. Rabies is one of the oldest diseases known to man. It’s entirely preventable, and yet it continues to kill around 59,000 people per year – mostly children. The virus enters the body through a bite from an infected animal. It then travels through the central nervous system, eventually taking over the brain. And once signs of the disease start to show, death is, sadly, almost inevitable. The African continent suffers with over a third of the world’s rabies cases. And with 99% of human rabies cases coming from an infected dog, rabies is the lightning rod of all dog issues in Africa. In Kenya, dogs are an integral part of the family. But they are not always treated as such. They fair lower in the list of priorities than other family-owned animals, such as livestock which bring in a vital income. So when rabies outbreaks occur, communities may respond by killing local dogs by poisoning or beating them to death. Pictured above, Joseph and his five month old puppy Bruno. Bruno has lived with Joseph and his family for just two months but is already part of the family. Bruno is one of the lucky dogs to receive a rabies vaccination this year and be protected from an inhumane death. World Animal Protection has partnered with the Makueni County government since the launch of a national plan to eliminate rabies by 2030. Makueni is one of Kenya’s most rabies-laden counties. Everyone in the county knows someone who has been affected by rabies. And since we last wrote to you, we’ve vaccinated over 55,000 dogs in the county. We’ll be vaccinating again in December, which puts us on track to have vaccinated 70% of the county’s total dog population by the end of 2016. It’s imperative to vaccinate this number of dogs to make sure the transmission cycle of rabies is broken, and the disease is eventually eliminated. These vaccination campaigns only use vaccinators working within the county already. This helps to build local capacity, keeps political will at its highest and makes sure that the county has full ownership of the campaign. “I have always had dogs, they are very important to my life, for security and for company that is why I have brought them to be vaccinated, I do not want them to get rabies . . . they are important to our whole family” said Kalondu Kisingu who owns three dogs, Yakila (which means greedy), Major and Kivoto (which means successful). Education is everything. You cannot change people’s assumptions without it. That’s why we recently trained 59 local teachers and four education officers in Makueni on how to care for dogs. Children are often dogs’ main caregivers, so it’s crucial we reach out to them if we’re to improve their lives. And as children are the most likely to fall victim to rabies, it’s just as vital to teach them how to interact safely with dogs to avoid getting bitten. Preventing dog bites not only helps to prevent rabies – it also protects dogs from experiencing fear and stress. As we speak, our team in Kenya is back visiting these local schools to see just how much impact this intervention has made. One teacher told us that she now feels she has enough knowledge and information to fight rabies like never before. Another – who lost her brother to rabies two years ago – has made a vow to spread these messages to as many other teachers as possible in her local ward. This time next year, we’ll be able to show that human rabies cases in Makueni are dropping. It takes a little while for results to show, but we know this approach will work. We’ve already done it on the Tanzanian island of Zanzibar where no human rabies cases have been reported since 2013. Kenya wants to eliminate rabies in the entire country by 2030. This coincides with global rabies elimination targets announced in December 2015. The World Health Organisation, Food and Agriculture Organisation of the United Nations and the World Organisation for Animal Health (OIE) want to see an end to rabies caused by dog bites across the world by 2030. World Animal Protection is there to make sure this goal is achieved without the use of cruel culls to control the disease. Ellie Parravani is a campaigner for ‘Better Lives for Dogs at World Animal Protection. See here to find out more about World Animal Protection’s work to protect dogs around the globe.